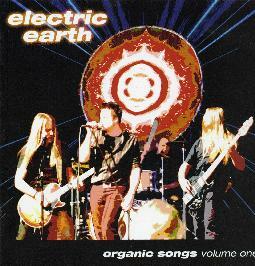 Electric Earth - "Organic Songs Volume One"
Electric Earth are a fairly new Swedish hard rock band. The digipack features fantastic artwork and a very nice booklet. Very organic! I reviewed a promo CD a while back with the great track, "Space Mammoth", which also appears here. This is the bands first full length record and I had high expectations and end up a bit disappointed. The CD opens with "Platnoic", the bands first single and video. It is very SOundgarden (1990-92 era) influenced in the way guitar and bass riff hits you. "Nowhere Fast", is very Pearl Jam inspired. I think the vocalist has a good and unique voice and no need to try to sound like Vedder on the chorus. Why???? "Space Mammoth" is next and has some cool programmed drums to go along with the real ones and is a really unique song and really shows the strength of the band. Great great song. I wish the rest held up to this standard. "Dragged Down" is a really nice laid back number that I really liked a lot. Great vocals on this track. "Detroit Destroyer" reminds me of 70’s KISS meets the Hellacopters! Fun song. "Sanctuary" is back to the Soundgarden guitar sound again and a strong track but not very original. "Superseded" is a melodic rock song with a real poppy multilayered vocal chorus (Alive). "Sin of the Century" is a track that I really like a lot. It starts with a slow build up of just guitar and drums and then some keyboards and the bass line slowly filter in. I really like the guitar sound and the powerful production of the CD. "Manic Hate" starts off quite poppy and very influenced by KISS and SOundgarden. "D.W.B." is a very heavy song with a cool sounding guitar. The CD closes with a cover of "In-a-gadda-da-vida" by Iron Butterfly. It is a unique version of the classic track but I didn’t like it at all. The CD has some great stuff on it but the band losses its vision and tries too hard to sound like SOundgarden and Pearl Jam. Great bands and a great sound but not new. Sorry guys. What happened?